Outerwear is always one of my favorite parts about dressing for Fall, and with all of the fun patterned and colorful blazers in stores this season I’m even more excited than usual. Not sure where to start? Time to check in with the experts! The Glitter Guide’s Fall Shopping Guide: Blazers. One of my new favorites to keep an eye on during Fashion Month is Russian designer and photographer Ulyana Sergeenko. Her style is dramatic, eye-catching, and perfectly over-the-top. And luckily for us fashion lovers she’s just one of many chic up and coming Russian fashionistas making the scene these days! You’ll thank me after you check out all of these lovely ladies in Bougeotte’s Modern Russian Czarinas Are Being Born. Beauty lovers have been buzzing about the new Courtin-Clarins beauty blog that launched last month. If you haven’t gotten a chance to see what these French beauties have to say now’s the time! WhoWhatWear – The Scoop: Claire & Virginie Courtin-Clarins. Patterned pants and all-over-prints on suits and shorts suits are all things that I’m excited to wear this Fall and next Spring, so why not check out some fabulous versions worn lately to get you in the mood? The Next Evolution of Fashion’s Print Obsession: The Printed Suit. I recently discovered a fun new fashion blog that I’d love to share – Advanced Style was created by Ari Seth Cohen and celebrates the fabulous fashion of the older generations. As someone who grew up on Audrey Hepburn and Cary Grant movies, couldn’t wait to start working after college so I could have a formal wardrobe, and dresses up to travel – this is right up my alley. I love the formality and classic approach to fashion celebrated by previous generations and this website is a great place to find stunning photographs of just that. Enjoy! I remember thinking at 18 that 30 was so old but now as I’m swiftly approaching the big three-oh my thinking has changed – I’m looking forward to the things that I’m going to accomplish in my thirties, the goals I’m going to set, the places I’m going to visit. Needless to say I was thrilled when I saw this article – Does life really begin at 30? Sweet potatoes are a great favorite of mine – I love that there are an endless number of recipes that you can make with them, from snacks to savory dinner to sweet desserts. Versatile and delicious, what more could a girl want? More recipes to try of course! 10 Healthy Sweet Potato Recipes: Easy and tasty sweet potato recipes, each with about 300 calories or less. Finding new recipes, reading about food, health & nutrition, and finding great food blogs written by creative, passionate people are some of my favorite pastimes so I was thrilled when Green Thickies posted a list of the their favorite blogs – Some I already knew and others I eagerly looked up. I had dozens of recipes printed in minutes! 🙂 Check out 8 Best Vegan Blogs for links and recipes to try! Sometimes when I look at a recipe I’ll immediately think “no” in my mind when I look at the amount of oil, butter, or sugar being recommended. Rather than count certain recipes out, we can substitute healthier, nutritious ingredients for the more calorically dense, fattening ones. Apple sauce is one of my go-to ingredients to lighten up a recipe, but for Fall why not try pumpkin? 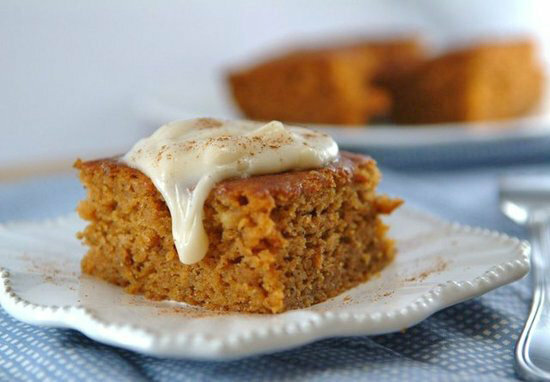 How to Substitute Pumpkin Puree For Butter and Oil. Speaking of pumpkin, this was one of the first pumpkin recipes I made this season when Trader Joe’s started stocking the shelves with canned pumpkin – How To Make A Quick Healthy Pumpkin Pie Fudge. So. Good.